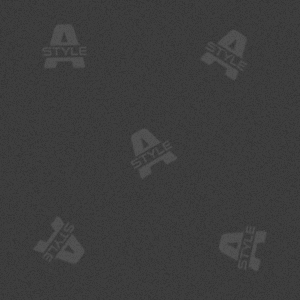 episode, irrespective of whether it is symptomatic or self-limited. cardioversion has failed or because cardioversion has not been attempted Classification scheme for patients with atrial fibrillation. maintain sinus rhythm may prevent comorbidities associated with AF. presentation of AF or the result of recurrent episodes of paroxysmal AF. have the best supporting data. are similar, but not identical, to those of atrial myocytes. tumors or thrombi are rare causes. artery disease infrequently leads directly to atrial ischemia and AF. Hyperthyroidism, diabetes, and pheochromocytoma have been associated with AF. variants and other AF risk factors. AF is strongly age-dependent, affecting 4% of individuals older than 60 years and 8% of persons older than 80 years. fibrillation affects more than 2.2 million persons in the United States. the prevalence of AF is expected to more than double by the year 2050.
aged 50-59 years, and it approaches 30% for those aged 80-89 years. particularly at high risk for developing heart failure when AF occurs. adequate rate control is not established. dyspnea, fatigue, dizziness, angina, and decompensated heart failure. diseases, such as left ventricular hypertrophy and preexcitation. Ventricular rate varies from 130-168 beats per minute. Rhythm is irregularly irregular. P waves are not discernible. When TEE is planned, the concurrent use of TTE may increase cost without providing significant additional information. to create anatomic maps of the left atrium and pulmonary veins. pathology (eg, pulmonary embolism, pneumonia). evaluate rate control (eg, target average rate of 100 bpm or less). considered appropriate for primary treatment. Go to Catheter Ablation for complete information on this topic. warfarin therapy in low-risk patients with AF is not advantageous. factors include prior stroke, TIA, and systemic thromboembolism. 65-74 years, coronary artery disease, and thyrotoxicosis. extrinsic factors that influence atrioventricular (AV) conduction. Foremost among these are the intrinsic AV nodal conduction properties. fibrillation is the need for anticoagulation (see the image below). the risk of stroke 3-fold. INR < 2 for 3 consecutive weeks. Warfarin: INR target 2-3.
alternative to warfarin in a higher-risk population with nonvalvular AF. balanced between the risk of stroke and the risk of bleeding. dose warfarin, (2) dabigatran 110 mg bid, or (3) dabigatran 150 mg bid. depending on the patient’s risk of bleeding and risk of thromboembolism. attempt at a rhythm-control strategy should be made in most patients. patients who experience primarily exertional AF-related symptoms. requires close monitoring of drug levels and renal function. prolongation and torsade de pointes. disease or severe pulmonary disease (Class I, evidence level A). 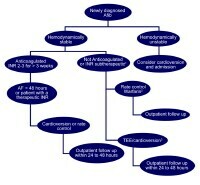 It is reasonable as a treatment for symptomatic persistent AF. Catheter ablation may be reasonable as a treatment for symptomatic paroxysmal AF in patients with some structural heart disease. to thrombus formation even though the patient is in sinus rhythm. agents include procainamide, digoxin, and sotalol. 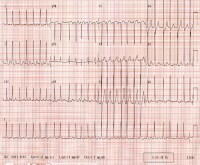 persistent AF to normal sinus rhythm (NSR). used as prophylactic therapy in those at high risk for postoperative AF. between episodes in patients with sick sinus syndrome. is to disconnect triggers and/or to modify the substrate for AF. deliver transmural lesions in the left atrium. ablation has fallen over the years and is likely to continue to fall. diagnostic workup with TEE, spiral CT scanning, or MRI is recommended. symptoms. Go to Catheter Ablation for complete information on this topic. an uncontrolled ventricular response despite aggressive medical therapy. anticoagulation; however, most patients are relieved of their symptoms. be appropriate. Improvements in LV size and function, functional class, and quality-of-life scores have been demonstrated. a patient with AF and provides crucial follow-up care. diabetes, and heart failure is likely to decrease the incidence of AF. therapy for patients at moderate to high risk of thromboembolic events. amiodarone and dofetilide can be considered as alternative agents. without structural heart disease or other risk factors. reduce the rate of AV nodal conduction and control ventricular response. agents slow the sinus rate and decrease AV nodal conduction. Beta-blockers now have more of a secondary role in AF rate control. carefully monitor blood pressure, heart rate, and ECG. but requires close monitoring of drug levels and renal function. digoxin) may be superior to individual agents in some patients. with paroxysmal AF and no associated structural heart disease. conduction (producing fast ventricular rates) can occur. also used widely for maintenance of sinus rhythm in patients with AF. or who will be cardioverted. does not actively lyse but is able to inhibit further thrombogenesis. 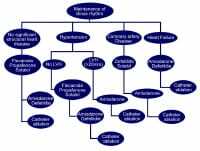 venous thrombosis, pulmonary embolism, and thromboembolic disorders. thromboxane A2 (potent vasoconstrictor and platelet aggregate). Platelet-inhibition lasts for the life of the cell (approximately 10 d). with lone AF or contraindications.